12 p. : ; 23 cm. RI'I\K OF PLANT I NI'STl I Y- (Circular No. 43. B. T. GiALLO*WAY, Chitif <( IBurvu. J. \V. T. I 'xVErL. C11,ff f Pinau, BEVEIRLY T. < ;ALLO<\A. Assistant ('thnff lurJIU, A I. IRT F. NVO()I)S.
Chitf (C' rl:, J.\Ml Is E. JoN ES. Thi, iin coopieraitio wN ith tli< Bait miore ;niil (h)lhe lW41lI44a4 ('am!) 4ii]>;n\. standling of tlhe purpose ndi value 4f invest 0-. 1 ions of t Ilis character. CORN STORED IN ELEVATOR BIN. THE DETERIORATION OF CORN IN STORAGE. of corn from the Dakotas. Bus. I'. ct. Lbh. Grqm,. P. et. P. c. P. c t. P ct. 1. ct. I ct.
10 . (1( 6 53. 3 272 90(. 3 1.4 1 I 1.2 3.9 71. 130 bushels of corn emptied into the tin. THE DETERWoHlAT"ON UF tiIiN IN SIT1.(ii:. the Illinois orn c tontainod in thl eighth anti in i draltfi s.
end ot' the experiment, ,ich extendedt owvr a pi d oml,' f( da& vs.
temp1 rature ol' tile air hi tile elevator varied front 16) t" o I W;\l V.
r'(eadinqgs turin tlIhe i, nI ,i Al _1 p z fve dtayvs o4 thle test. s inches below the surface (if the jrrain. *<'. /--183% O/ISTURE. 52.8Zs. per Bu. c-+ Thr*8 -/8.6% MO/STURE 533Lbs.perBu. 8^ 9TH .O0uu--/7 0%MO/ITUR'E 55.0Lbs.perBu. /-- --17.5%/MOISTURE. 54. 5Lbs. per Bu. | --/18.8% MOISTURE. 53.OLbs.per Bu. -/178 %MIO/STURE. 53.6Lbs. per Bu. ... <----/8. 0 %v MO/STURE 52.6 Lbs. per Bu. = ---179 % MOI/STURE. 53.3 Lbs per Bu. T-"-- / --178%/VO/STURE. 53.6Lbs.per Bu. |2ND. 500 Bu. TEMPERATURE 38 to 4Z/.5F. < -- --/79 % MOISTURE. 53. 8 Lbs per Bu. /178 %I/7t/Re. 53. Shs. per Ba. B ----'- TEMPERATURE 36 to 41/5"F"
nunler of samples represent ini thie 1th 0 t us ls iat tAlt, toipof t' l, bin. that H(ie corn near tlet, 1in walls it those points w\as dI_,'htlv sour. t1le f'ollhminim day. tihe corn having, ;iy enden to adhere Ito Ithe sides. tileho o a onsideorab ,le orlio o ()I e entire bhi ulk. THE DI'T.TE 0lU ATlION O1F" CORiN IN STOI'.iE. 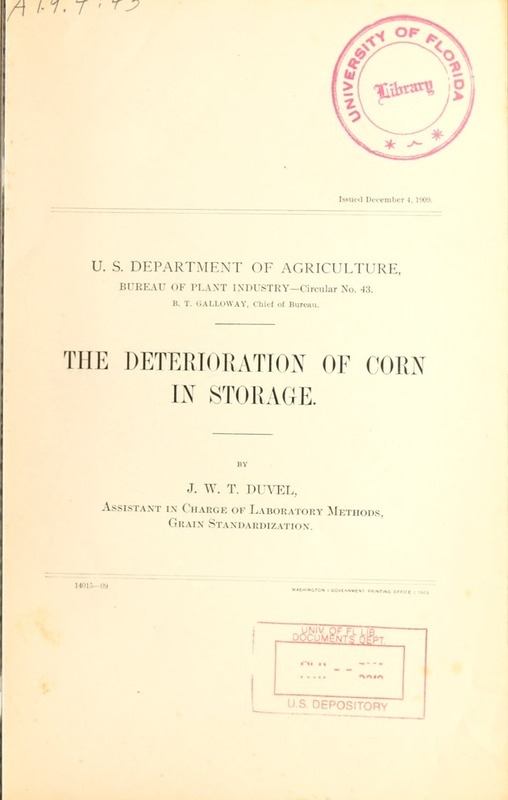 TIHE DETERIORATION OF CORN IN STORAGE. depth below thle surface as t liermometer No. 7, registered 71.5 F.
=.4/A/1 OR SNOW, .01 INCH OR MORE. 7 RAI//N OR SNOW, TRACE. | | =NO RAIN OR SNOW. minniiium air temperature, and the precipitation from February 17 to April 27. 1909. 69 days covered l)v thle exp)erimeint. ('CONI)ITION OF TIlE CORN AT THE ENI) OF THiE EXPERIMENT. T1itl DiETEI+OIATION OF COliN IN STIOAI GA;E.
decreased from 53 to 51 pomindls. ',1111 handled, dried, a1dl loaded into car No. 67031.
per cent when drawn from the bin, and S1.4 per cent after ',iiit. amounted to :(10 pumndls, or slightly less than o0e'-tenth oIf 1 per cent. DRIED DAMAGED CORN FROM TOP OF BIN STORED IN CAR. turc i 'oilfit ami Shrinka 61' in 1N.in," explain- +, ," thi-I ll r I. ,. ', *c cxi-l- m how it. THlE DETERIORATION OF CORN IN STORAGE. 3.73 per cent, which is equivalent to a loss in weight of 4.44 percent. temperature of the air in the car had varied from 56 to 82 F.
and(l tle temperature of thlie air outside of the car from 41 to 9O F.
days froin May 25 to June :13. UNDRIED CORN FROM BIN STORED IN CAR. THEll Dlo'TFW(WU \TiN <1' (IF (OHN IN' s'Tufl: . -- 12 THE DETERIORATION OF CORN IN STORAGE. >-- was influenced by the temperature of the outside air. 0 =--- LOSS IN MOISTURE AND SHRINKAGE. I V When tlie undried corn from the bin was first loaded into car No. S 75197, on April 27, the avr;g;, moisture content was 17.47 per cent. the average moisture content of the surface corn was 13.55 per cent. handling, was again hot, the temperature having increased from 73 F.
cent when reloaded, a reduction in moisture of 2.6 per cent in 9 (lays. uno opened from point of shiipm(ent to destination. Sfcre nar!/ of 0 ,i , ru . WkASIIN(I'ON, D. C., Noreuhr, b5, 1909.